The Bible (from Koine Greek τὰ βιβλία, tà biblía, "the books") is a collection of sacred texts in Judaism and Christianity. It is a collection of scriptures written at different times by different authors in different locations. Jews and Christians consider the books of the Bible to be a product of divine inspiration or an authoritative record of the relationship between God and humans. The canonical Bible varies depending on traditions or groups; a number of Bible canons have evolved, with overlapping and diverging contents. The Christian Old Testament overlaps with the Hebrew Bible and the Greek Septuagint; the Hebrew Bible is known in Judaism as the Tanakh. The New Testament is a collection of writings by early Christians, believed to be mostly Jewish disciples of Christ, written in first-century Koine Greek. These early Christian Greek writings consist of narratives, letters, and apocalyptic writings. 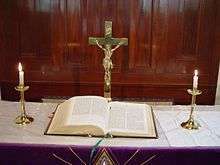 Among Christian denominations there is some disagreement about the contents of the canon, primarily in the Apocrypha, a list of works that are regarded with varying levels of respect. With estimated total sales of over 5 billion copies, the Bible is widely considered to be the best-selling book of all time. 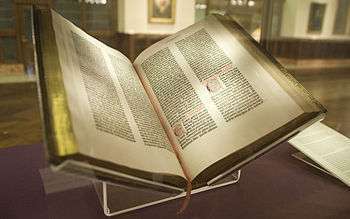 It has estimated annual sales of 100 million copies, and has been a major influence on literature and history, especially in the West where the Gutenberg Bible was the first mass-printed book. 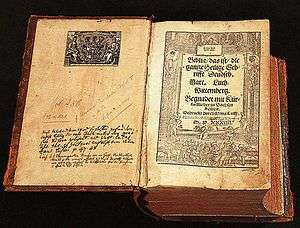 It was the first book ever printed using movable type. By the 2nd century BCE, Jewish groups had called the Bible books the "scriptures" and referred to them as "holy," or in Hebrew כִּתְבֵי הַקֹּדֶשׁ (Kitvei hakkodesh), and Christians now commonly call the Old and New Testaments of the Christian Bible "The Holy Bible" (in Greek τὰ βιβλία τὰ ἅγια, tà biblía tà ágia) or "the Holy Scriptures" (η Αγία Γραφή, e Agía Graphḗ). The Bible was divided into chapters in the 13th century by Stephen Langton and into verses in the 16th century by French printer Robert Estienne and is now usually cited by book, chapter, and verse. The oldest extant copy of a complete Bible is an early 4th-century parchment book preserved in the Vatican Library, and known as the Codex Vaticanus. The oldest copy of the Tanakh in Hebrew and Aramaic dates to the 10th century CE. The oldest copy of a complete Latin (Vulgate) Bible is the Codex Amiatinus, dating from the 8th century. Professor John K. Riches, Professor of Divinity and Biblical Criticism at the University of Glasgow, in an Oxford University Press introduction to the Bible, says that "the biblical texts themselves are the result of a creative dialogue between ancient traditions and different communities through the ages", and "the biblical texts were produced over a period in which the living conditions of the writers – political, cultural, economic, and ecological – varied enormously". Timothy H. Lim, a professor of Hebrew Bible and Second Temple Judaism at the University of Edinburgh, says that the Old Testament is "a collection of authoritative texts of apparently divine origin that went through a human process of writing and editing." He states that it is not a magical book, nor was it literally written by God and passed to mankind. Parallel to the solidification of the Hebrew canon (c. 3rd century BCE), only the Torah first and then the Tanakh began to be translated into Greek and expanded, now referred to as the Septuagint or the Greek Old Testament. The name Tanakh (Hebrew: תנ"ך‎) reflects the threefold division of the Hebrew Scriptures, Torah ("Teaching"), Nevi'im ("Prophets") and Ketuvim ("Writings"). 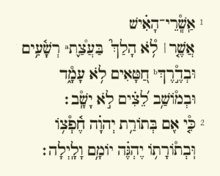 Nevi'im (Hebrew: נְבִיאִים Nəḇî'îm‎‎, "Prophets") is the second main division of the Tanakh, between the Torah and Ketuvim. It contains two sub-groups, the Former Prophets (Nevi'im Rishonim נביאים ראשונים, the narrative books of Joshua, Judges, Samuel and Kings) and the Latter Prophets (Nevi'im Aharonim נביאים אחרונים, the books of Isaiah, Jeremiah and Ezekiel and the Twelve Minor Prophets). 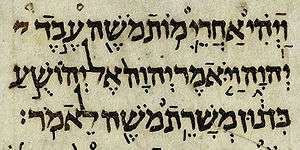 Ketuvim or Kəṯûḇîm (in Biblical Hebrew: כְּתוּבִים‎‎ "writings") is the third and final section of the Tanakh. The Ketuvim are believed to have been written under the Ruach HaKodesh (the Holy Spirit) but with one level less authority than that of prophecy. The Tanakh was mainly written in biblical Hebrew, with some small portions (Ezra 4:8–6:18 and 7:12–26, Jeremiah 10:11, Daniel 2:4–7:28) in biblical Aramaic, a sister language which became the lingua franca for much of the Semitic world. 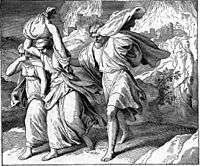 The older sections (mainly in the Book of the Watchers) are estimated to date from about 300 BC, and the latest part (Book of Parables) probably was composed at the end of the 1st century BCE. 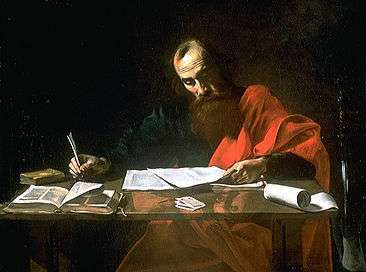 The Old Testament canon entered into Christian use in the Greek Septuagint translations and original books, and their differing lists of texts. 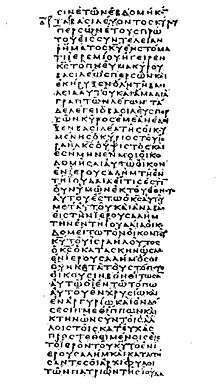 In addition to the Septuagint, Christianity subsequently added various writings that would become the New Testament. Somewhat different lists of accepted works continued to develop in antiquity. In the 4th century a series of synods produced a list of texts equal to the 39, 46/51, 54, or 57-book canon of the Old Testament and to the 27-book canon of the New Testament that would be subsequently used to today, most notably the Synod of Hippo in 393 CE. 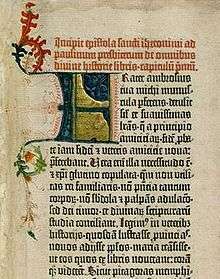 Also c. 400, Jerome produced a definitive Latin edition of the Bible (see Vulgate), the canon of which, at the insistence of the Pope, was in accord with the earlier Synods. With the benefit of hindsight it can be said that this process effectively set the New Testament canon, although there are examples of other canonical lists in use after this time. 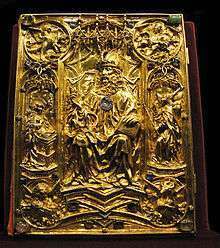 Pope Damasus I assembled the first list of books of the Bible at the Council of Rome in 382 CE. 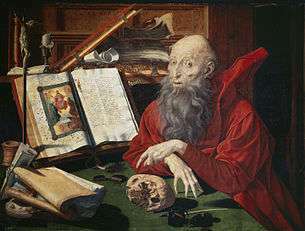 He commissioned Saint Jerome to produce a reliable and consistent text by translating the original Greek and Hebrew texts into Latin. This translation became known as the Latin Vulgate Bible, in the fourth century CE. And in 1546, at the Council of Trent, Jerome's Vulgate translation was declared by the Roman Catholic Church to be the only authentic and official Bible in the Latin Church. ↑ "Best selling book of non-fiction". Guinness World Records. Retrieved 9 December 2015. ↑ Ryken, Leland. "How We Got the Best-Selling Book of All Time". The Wall Street Journal. Retrieved 9 December 2015. ↑ "The battle of the books". The Economist. 22 December 2007. 1 2 Harper, Douglas. "bible". Online Etymology Dictionary. ↑ "The Catholic Encyclopedia". Newadvent.org. 1907. Retrieved 2010-04-23. 1 2 Stagg, Frank. New Testament Theology. Nashville: Broadman, 1962. ISBN 0-8054-1613-7. ↑ Bruce, Frederick (1988). The Canon of Scripture. Downers Grove, Illinois, U.S.: IVP Academic. p. 214. ISBN 083081258X. ↑ "Where did the chapter and verse numbers of the Bible originate?". CA. ↑ Davies, Philip R. (2008). Memories of ancient Israel. Westminster John Knox Press. p. 7. ISBN 978-0-664-23288-7. ↑ Riches, John (2000). The Bible: A Very Short Introduction. Oxford: Oxford University Press. p. 83. ISBN 978-0-19-285343-1. ↑ Riches, John (2000). The Bible: A Very Short Introduction. Oxford: Oxford University Press. p. 9. ISBN 978-0-19-285343-1. ↑ Lim, Timothy H. (2005). The Dead Sea Scrolls: A Very Short Introduction. Oxford: Oxford University Press. p. 41. ↑ Riches, John (2000). The Bible: A Very Short Introduction. Oxford: Oxford University Press. p. 37. ISBN 978-0-19-285343-1. 1 2 Riches, John (2000). The Bible: A Very Short Introduction. Oxford: Oxford University Press. pp. 23, 37. ISBN 978-0-19-285343-1. ↑ A 7th-century fragment containing the Song of the Sea (Exodus 13:19–16:1) is one of the few surviving texts from the "silent era" of Hebrew biblical texts between the Dead Sea Scrolls and the Aleppo Codex. See "Rare scroll fragment to be unveiled," Jerusalem Post, May 21, 2007. ↑ Elliot N. Dorff 1979 Conservative Judaism: Our Ancestors to Our Descendants. United Synagogue. p. 98–99 (114–115 in 1978 edition) Archived 6 September 2015 at the Wayback Machine. ↑ Milton Steinberg 1947 Basic Judaism Harcourt Brace, p. 27–28 ISBN 0-15-610698-1 Archived 6 September 2015 at the Wayback Machine. 1 2 Karen H. Jobes and Moises Silva (2001). Invitation to the Septuagint. Paternoster Press. ISBN 1-84227-061-3. ↑ "The translation, which shows at times a peculiar ignorance of Hebrew usage, was evidently made from a codex which differed widely in places from the text crystallized by the Masorah." "Bible Translations – The Septuagint". JewishEncyclopedia.com. Retrieved 10 February 2012. 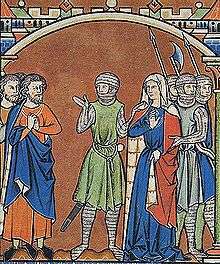 ↑ "Two things, however, rendered the Septuagint unwelcome in the long run to the Jews. Its divergence from the accepted text (afterward called the Masoretic) was too evident; and it therefore could not serve as a basis for theological discussion or for homiletic interpretation. This distrust was accentuated by the fact that it had been adopted as Sacred Scripture by the new faith [Christianity] [...] In course of time it came to be the canonical Greek Bible [...] It became part of the Bible of the Christian Church." "Bible Translations – The Septuagint". JewishEncyclopedia.com. Retrieved 10 February 2012. ↑ "NETS: Electronic Edition". Ccat.sas.upenn.edu. 2011-02-11. Retrieved 2012-08-13. 1 2 This article incorporates text from the 1903 Encyclopaedia Biblica article "TEXT AND VERSIONS", a publication now in the public domain. 1 2 Jennifer M. Dines, The Septuagint, Michael A. Knibb, Ed., London: T&T Clark, 2004. ↑ Obdiou is genitive from "The vision of Obdias," which opens the book. ↑ "Dead Sea Scrolls" (PDF). Retrieved 2013-06-06. ↑ The Council of Trent confirmed the identical list/canon of sacred scriptures already anciently approved by the Synod of Hippo (Synod of 393), Councils of Carthage (The Council of Carthage, 28 August 397), and Council of Florence (originally Council of Basel), Session 11, 4 February 1442 —[Bull of union with the Copts] seventh paragraph down. ↑ "Paragraph 120". Catechism of the Catholic Church, Second Edition. Libreria Editrice Vaticana. 2012. Retrieved 6 August 2014. ↑ "The Ethiopian Orthodox Tewahedo Church". Ethiopianorthodox.org. Archived from the original on 5 November 2010. Retrieved 2010-11-19. ↑ Grudem, Wayne (1994). Systematic Theology. Leicester, England: Inter-Varsity Press. pp. 49–50. ↑ Rice, John R. - Our God-Breathed Book: The Bible - ISBN 0-87398-628-8, Sword of the Lord Publishers, 1969, pp 68-88. ↑ "Basis for belief of Inspiration Biblegateway". Biblegateway.com. Retrieved 2010-04-23. ↑ International Council on Biblical Inerrancy (1978). "The Chicago Statement on Biblical Inerrancy" (PDF). International Council on Biblical Inerrancy. Archived from the original (PDF) on 13 April 2008. ↑ "Ruckman's belief in advanced revelations in the KJV". Retrieved 27 February 2014. ↑ Riches, John (2000). The Bible: A Very Short Introduction. Oxford: Oxford University Press. p. 134. ISBN 978-0-19-285343-1. ↑ "Expondo Os Erros Da Sociedade Bíblica Internacional". Baptistlink.com. 2000. Retrieved 2012-01-13. 1 2 Putnam A.M., Geo. Haven. Books and Their Makers During The Middle Ages. Vol. 1. New York: Hillary House, 1962. Print. Finkelstein, Israel; Silberman, Neil Asher (2001). "The Bible Unearthed: Archaeology's New Vision of Ancient Israel and the Origin of Its Sacred Texts". New York: Simon & Schuster. ISBN 0-7432-2338-1. Dever, William G. Who Were the Early Israelites and Where Did They Come from? Grand Rapids, MI: William B. Eerdmans Publishing Company, 2003. ISBN 0-8028-0975-8.